Plate Freezing Fish in New England for the Petfood Industry – Finicky Pet Food, Inc. When it come to effectively and efficiently preserving, safeguarding, and transporting frozen fish in New England or anywhere in the world, plate freezing fish is considered to be one of the most popular methods of freezing, simply because it works. While there are lots of ways to freeze fish for the petfood industry, companies like Finicky Pet Food, Inc. rely on plate freezing fish for the very best in pet food safety. This method is used by large processing factories, as well as on board fishing vessels around the globe. The entire goal of freezing fish is to reduce spoilage by lowering the temperature to a safe range. Fish will typically go bad or spoil due to bacteria or through the natural breakdown of the flesh by a method known as “self-digestion,” which is caused by active enzymes inside the fish. Freezing stops both methods from occurring, helping to prepare fish for safe storage until it is ready to be used as an ingredient in quality pet food products. It is important for the process of plate freezing fish to be done according to industry standards and regulations to protect and prepare seafood for the petfood industry properly. Processing differences can include the amount of freezing time, which defines how long it takes for the temperature of the “warmest part’ of the fish that is being frozen to be reduced to -20 degrees Celsius, and the storage temperature. There are a lot of reasons why companies purchase frozen fish from New England for pet food safety and nutrition in their products. Fish is the perfect choice for freezing, providing even better results across the board. 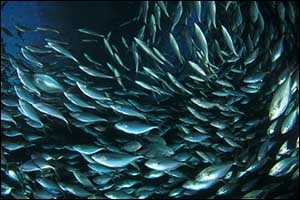 The fish itself is made up of somewhere between 60-80 percent of water, depending on the species and the time of year. Also, the fluids within the fish contain salts and other compounds, which is why fish muscle freezes differently than plain water. Because the temperature must be lower than what is required to freeze water, a longer freezing time may be necessary. It is important for companies that provide seafood ingredients to the petfood industry pay close attention to freezing times and temperatures to provide clients with quality ingredients that adhere to pet food safety standards. The type of freezer can even affect the freeze time of frozen fish, so it is important for processors to take the time to create standards of practice for best results. The internal temperature of the fish before freezing should be as low as possible. In fact, many processors believe in chilling the fish in giant plastic containers before processing. This process can help to maintain the quality of the fish and lower the amount of time required for freezing. Poor contact between the fish and the plate can result in more freezing time being required for proper processing of frozen fish in New England. Contact issues can come from an ice buildup on the plates or packs that are only partially filled, creating a surface void. Because there is such a variance in plate freezing fish that can occur between the species, it is important for processing companies to have an understanding regarding the different requirements for each type of fish. We provide products that include Cod, Herring, Mackerel, Oceanfish, Salmon, Sardines, Shrimp, Sole, and Tuna, each of which has different freezing temperatures. Herring, which is a very fatty fish, can freeze much faster than a fish that is leaner. However, the amount of fat content can vary throughout the seasons. When it comes time to choose the supplier of ingredients for your products, pet food safety should be a high priority. Not only is it required by the United States Food and Drug Administration (FDA), but there are stringent standards that must be met to be approved for sale in each state. A wide range of products falls under the legal category of the petfood industry, including complete and balanced foods, treats and snacks, nutrient supplements, nutrient-added waters, edible chews, and non-nutritional supplements, such as herbs and botanicals. The use of frozen fish in New England as a nutrient source, ingredient, or flavor enhancer is widespread across the country and around the globe. Companies like Finicky Pet Food, Inc. provide standard and custom products for clients that are designed to meet the specifications set by the pet food factories to meet a variety of standards, including nutritional, fat, and moisture. To learn more about our products or to speak with someone in our Sales Division, give us a call at 508-991-8448 or use our online contact form.